For the small archipelago in the Alaska Panhandle, see San Juan Islands (Alaska). The San Juan Islands are an archipelago in the northwest corner of the contiguous United States between the U.S. mainland and Vancouver Island, British Columbia, Canada. The San Juan Islands are part of the U.S. state of Washington. In the archipelago, four islands are accessible by passenger ferry operated by the Washington State Ferries system. Archaeologists use the term "Gulf of Georgia Culture Area" to refer to the San Juan and Gulf Islands, the whole of which shows many archaeological commonalities. The San Juan Islands were part of the traditional area of various peoples of the Coast Salish ethnolinguistic group. Linguistically, Coast Salish groups in the area consist of the Nooksack, Northern Straits (which includes the Lummi, Klallam, Saanich, Samish and Songhees dialects). Exploration and settlement by Europeans brought smallpox to the area by the 1770s. The explorations of 1791 were carried out in partnership with the Royal Navy ships under the command of George Vancouver, while American explorations were led by Charles Wilkes. Despite having colonized the area entirely, the British and Americans retained many of the Spanish names which survive today. The name "San Juan" was given to the islands by the Spanish explorer Francisco de Eliza, who charted the islands in 1791, naming them Isla y Archiepelago de San Juan. The expedition sailed under the authority of the Viceroy of Mexico, Juan Vicente de Güemes Padilla Horcasitas y Aguayo, 2nd Count of Revillagigedo and Eliza named several places for him, including the San Juan Islands, Orcas Island (short for "Horcasitas") and Guemes Island. San Juan Island's first European discoverer was one of the officers under Eliza's command, Gonzalo López de Haro, for whom Haro Strait is named. The Spanish had found the islands a year earlier during the exploring voyage of Manuel Quimper on the Princesa Real, but it was not clear to them that they were islands. Vancouver's expedition occurred within a year of Eliza's, and Vancouver encountered other Spanish ships and traded information. Thus Vancouver knew of the names given by Eliza's expedition and tended to keep them, although he renamed some features, like the Strait of Georgia. Wilkes, sailing in 1841, had some British charts, but may not have been aware of the Spanish names and charts. He liberally gave new names to nearly every coastal feature not already named on the charts he had. The names that Wilkes gave tended to be patriotically American (heroes of the War of 1812 for example), or to honor members of his crew. In 1847, due to the confusion of multiple names on different charts, the British Admiralty reorganized the official charts of the region. The project, led by Henry Kellett, applied only to British territory, which at the time included the San Juan Islands, but not Puget Sound. Kellett systematically kept the British and Spanish names and removed nearly all of Wilkes' names. In some cases Kellett moved Spanish names around to replace names given by Wilkes. Thus, in Puget Sound, the names given by Wilkes are common and Spanish names rare, while the reverse is true for the San Juan and Gulf Islands, although the Spanish did not explore Puget Sound as thoroughly as the British and Americans, resulting in fewer Spanish names at the outset. Wilkes had given the name Navy Archipelago to the San Juan Islands, and named individual islands for distinguished officers of the US Navy, such as Rodgers Island for San Juan Island, and Hull Island for Orcas Island. Some of his names survived the editing of Kellett, such as Chauncey, Shaw, Decatur, Jones, Blakely, Perry, Sinclair, Lawrence, Gordon, and Percival, all named after American naval officers. In 1843, the Hudson's Bay Company established Fort Camosun at nearby Vancouver Island. The 1846 Oregon Treaty established the 49th parallel as the boundary between Canada and the U.S. west to the middle of the Strait of Georgia, and then by the main channel south to the Strait of Juan de Fuca and from there westwards to the open ocean. While both sides agreed that all of Vancouver Island would remain British, the treaty did not specify which channel the boundary should follow between the Strait of Georgia and the Strait of Juan de Fuca, resulting in a boundary dispute. This dispute, though simmering immediately in the wake of the treaty, escalated in the 1850s. In 1852 the Territory of Oregon created Island County, defined to include the San Juan Islands (or "Haro Archipelago"). In 1853 Island County became part of the newly created Washington Territory. Washington Territory's legislature created Whatcom County out of parts of Island County in March 1854, including the San Juan Islands. The islands were finally split off Whatcom County into present day San Juan County on October 31, 1873. In 1855, Washington Territory levied a property tax on properties of the Hudson's Bay Company on San Juan Island, which the HBC refused to pay. Washington Territory then advertised and sold the properties to satisfy the unpaid taxes. This led to talks between the governors of Washington Territory and the Colony of Vancouver Island. It soon became clear that the US claimed Haro Strait as the international border, while Britain claimed Rosario Strait, with both sides laying claim to the San Juan Islands. The escalating dispute led to the Pig War in 1859 and the resulting San Juan Dispute, which was a protracted diplomatic confrontation. Effectively a stalemate, with no clear legal arguments, it continued until the boundary issue was eventually placed in the hands of Emperor Wilhelm I of Germany for arbitration in 1871. The border, through Haro Strait, was finally established in 1872. The surrounding bodies of water, including Puget Sound and the Straits of Georgia and Juan de Fuca, were recognized collectively as the Salish Sea, by the United States in 2009 and by Canada in 2010. The islands were heavily logged in the nineteenth century, but now have an extensive second-growth coast Douglas fir (Pseudotsuga menziesii var. menziesii), Pacific madrone (Arbutus menziesii), red alder (Alnus rubra) and bigleaf maple (Acer macrophyllum) forest. There are rare stands of old-growth Douglas fir and western redcedar (Thuja plicata). In the highlands one also finds grand fir (Abies grandis), western hemlock (Tsuga heterophylla) and other subalpine trees. The San Juan Islands host the greatest concentration of bald eagles (Haliaeetus leucocephalus) in the contiguous United States. Great blue herons (Ardea herodias), black oystercatchers (Haematopus bachman), and numerous shorebirds are found along the shore and in winter, the islands are home to trumpeter swans (Cygnus buccinator), Canada goose (Branta canadensis) and other waterfowl. Peregrine falcons (Falco peregrinus), northern harriers (Circus cyaneus), barred owls (Strix varia) and other birds of prey are found. In addition diving birds such as rhinoceros auklet (Cerorhinca monocerata), pigeon guillemots (Cepphus columba) and endangered marbled murrelet (Brachyramphus marmoratus) frequent the surrounding seas. Western bluebirds (Sialia mexicana), which were eliminated from the islands 50 years ago because of competition for nesting sites by non-native European starlings (Sturnus vulgaris), were recently restored to San Juan Island thanks to the efforts of volunteers and conservation organizations. The islands are famous for their resident pods of orcas (Orcinus orca). There are three resident pods that eat salmon, but also some transient orcas that come to take harbor seals (Phoca vitulina). Other marine mammals include the river otter (Lontra canadensis), Steller sea lions (Eumetopias jubatus), common minke whales (Balaenoptera acutorostrata), Dall's porpoise (Phocoenoides dalli) and other cetaceans. Columbia black-tailed deer (Odocoileus hemionus columbianus) are the largest mammals on the San Juan Islands, which are unusual in their historic absence of large carnivores, except for wolves (Canis lupus) which were extirpated in the 1860s. Dr. Caleb B. R. Kennerly, surgeon and naturalist, collected a wolf specimen on Lopez Island, which is now in the National Museum of Natural History, probably during the Northwest Boundary Survey from 1857 to 1861. Also, there is a specimen of elk in the Slater Museum of Natural History at the University of Puget Sound that was collected on Orcas Island, and old-timers report finding elk antlers on both Lopez and Orcas Islands. Before 1850, most of the freshwater on the islands was held in beaver (Castor canadensis) ponds, although the aquatic mammal was extirpated by Hudson's Bay Company fur stations at Fort Langley and San Juan Island. Remnants of beaver dams number in the hundreds across the archipelago. Gnawed stumps and beaver sign are now seen on Orcas and other islands, and recolonization by this keystone species is likely to lead to increased abundance and diversity of birds, amphibians, reptiles and plants. In spring, 2011 a pair of beaver appeared at Killebrew Lake on Orcas Island, but were killed to avoid flooding a phone company switch box buried under Dolphin Bay Road. These beaver likely swam from the mainland and could have recolonized the islands. Northern sea otter (Enhydra lutis kenyoni) remains are documented on Sucia Island in the San Juan Islands archipelago. In 1790, Spanish explorer Manuel Quimper traded copper sheets for sea otter pelts at Discovery Bay, for live sea otters captured north of the bay in the "interior" of the Strait of Juan de Fuca. Although historical records of sea otter in the San Juan Islands are sparse, there is a sea otter specimen collected in 1897 in the "Strait of Fuca" in the National Museum of Natural History. When the sea otter finally received federal protection in 1911, Washington's sea otter had been hunted to extinction, and although a small remnant population still existed in British Columbia, it soon died out. Fifty-nine sea otters were re-introduced to the Washington coast from Amchitka Island, Alaska in the summers of 1969 and 1970 and these have expanded by 8% per year, mainly along the outer west and northwest coast of the Olympic Peninsula. Professional marine mammal biologists verified a single sea otter observed near Cattle Point, San Juan Island in October 1996. Although the historical numbers of sea otter in the San Juan Islands is not known, the habitat for them may have once been ideal. In the 1890s non-native European rabbits, an exotic invasive species, began to infest the islands as the result of the release of domestic rabbits on Smith Island. Rabbits from the San Juan Islands were used later for several introductions of European rabbits into other, usually Midwestern, states. The rabbits are pursued by Eurasian red fox (Vulpes vulpes), another non-native species introduced intermittently through the twentieth century. On the islands is the San Juan Islands National Monument with 75 sections. The United States Geological Survey (USGS) defines the San Juan Islands as the archipelago north of the Strait of Juan de Fuca, west of Rosario Strait, east of Haro Strait, and south of Boundary Pass. To the north lie the open waters of the Strait of Georgia. All these waters are within the Salish Sea. The USGS definition of the San Juan archipelago coincides with San Juan County. Islands not in San Juan County are not part of the San Juan Islands, according to the USGS. Unidentified San Juan Island at night. Today, the San Juan Islands are an important tourist destination, with sea kayaking and orca whale-watching (by boat or air tours) two of the primary attractions. Politically, the San Juan Islands comprise, by definition, San Juan County, Washington. At mean high tide, the archipelago comprises over 400 islands and rocks, 128 of which are named, and over 478 miles (769 km) of shoreline. The majority of the San Juan Islands are quite hilly, with some flat areas and valleys in between, often quite fertile. The tallest peak is Mount Constitution, on Orcas Island, at an elevation of almost exactly a 1⁄2 mile (2,600 ft; 800 m). The coastlines are a mix of sandy and rocky beaches, shallow and deep harbors, placid and reef-studded bays. Gnarled, ochre-colored madrona trees (Arbutus) grace much of the shorelines, while evergreen fir and pine forests cover large inland areas. The San Juan Islands get less rainfall than Seattle, about 65 miles (105 km) to the south, due to their location in the rain shadow of the Olympic Mountains to the southwest. Summertime high temperatures are around 70 °F (21 °C), while average wintertime lows are in the high 30s and low 40s Fahrenheit (around 5 degrees Celsius). Snow is infrequent in winter, except for the higher elevations, but the islands are subject to high winds at times; those from the northeast sometimes bring brief periods of freezing and Arctic-like wind chill. Panoramic view of the San Juan Islands from the ferry. There are no bridges to the San Juan Islands; therefore, all travel from the mainland is either by water or by air. Four ferry systems serve some of the San Juan Islands. Clipper Navigation's Victoria Clipper provides seasonal ferry service to Friday Harbor from Vancouver Island and Seattle. North Shore Charters provides high-speed water taxi service to all of the San Juan Islands. Victoria Clipper offers overnight packages between Victoria,British Columbia, Seattle and San Juan Island. San Juan Airlines (to and from Anacortes, Bellingham, Eastsound (Orcas Island), Lopez Island, Blakely, Decatur). They merged Northwest Sky Ferry, an inter-island carrier serving: Bellingham, Anacortes, Friday and Roche Harbors (San Juan Island), Eastsound (Orcas Island) and Lopez, Waldron, Shaw, Stuart, Blakely, Center, Crane, Decatur and Eliza Islands, and also Seattle. 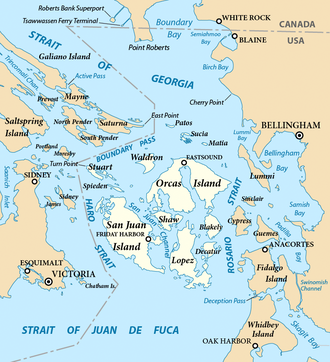 The San Juan Islands are surrounded by major shipping channels. Haro Strait, along with Boundary Pass, is the westernmost and most heavily used channel connecting the Strait of Juan de Fuca and the Strait of Georgia. It is the main route connecting the Port of Vancouver and other ports around the Strait of Georgia with the Pacific Ocean. Haro Strait joins Boundary Pass at Turn Point on Stuart Island, where a major navigation beacon, Turn Point Light, is located. Strong, dangerous rip tides occur near Turn Point, as well as near the northern end of Boundary Pass, between Patos Island Light on Patos Island and East Point on Saturna Island. Rosario Strait is also a major shipping channel. More than 500 oil tankers pass through the strait each year, to and from the Cherry Point Refinery and refineries near Anacortes. The strait is in constant use by vessels bound for Cherry Point, Bellingham, Anacortes, and the San Juan Islands. Vessels bound for British Columbia or Alaska also frequently use it in preference to the passages farther west, when greater advantage can be taken of the tidal currents. This list includes only those islands that are part of San Juan County as defined by the USGS, bounded by the Strait of Juan de Fuca, Haro Strait, Rosario Strait, Boundary Pass, and the Strait of Georgia. ^ Stein, Julie K. (2000). Exploring Coast Salish prehistory: the archaeology of San Juan Island. University of Washington Press. pp. 4–5. ISBN 978-0-295-97957-1. Retrieved July 30, 2011. ^ Scholefield, Ethelbert Olaf Stuart; Howay, Frederic William (1914). British Columbia from the earliest times to the present. Vol. 2. The S.J. Clarke publishing company. p. 301. OCLC 697901687. Archived from the original on May 27, 2011. Retrieved June 22, 2011. ^ Rebecca Smith (March 30, 2015). "Bald Eagles". San Juan Island National Historical Park Washington. National Park Service. ^ Gardner, Mark B. (2008). Images of the San Juan Islands. Rainshadow Arts. ISBN 978-0-9753068-1-9. ^ Mapes, Lynda V. (March 14, 2007). "Volunteers returning bluebirds to old nesting grounds". Seattle Times. Retrieved July 3, 2011. ^ "Biodiversity and the Salish Sea". Archived from the original on February 23, 2010. Retrieved July 3, 2011. ^ "Canis lupus, Specimen #A3438". Smithsonian National Museum of Natural History. Retrieved July 10, 2011. ^ a b Kenyon, Karl W. (1969). "The Sea Otter in the Eastern Pacific Ocean". North American Fauna: 1–352. doi:10.3996/nafa.68.0001. Retrieved July 3, 2011. ^ Scott Richardson; Harriet Allen (2000). Washington State Recovery Plan for the Sea Otter (PDF) (Report). Olympia, Washington: Washington Department of Fish and Wildlife. Retrieved July 3, 2011. ^ "Nonnative Species". Kwiaht Center for the Historical Ecology of the Salish Sea. Retrieved July 3, 2011. ^ a b "San Juan Islands". Geographic Names Information System. United States Geological Survey. Retrieved January 31, 2011. ^ Scherer, Migael (2004). A Cruising Guide to Puget Sound and the San Juan Islands: Olympia to Port Angeles. McGraw-Hill Professional. p. 201. ISBN 978-0-07-142039-6. Retrieved June 23, 2011. ^ "San Juan Islands Vacation". ^ "San Juan Airlines". San Juan Islands. ^ Scherer, Migael (2004). A Cruising Guide to Puget Sound and the San Juan Islands: Olympia to Port Angeles. McGraw-Hill Professional. p. 202. ISBN 978-0-07-142039-6. Retrieved June 23, 2011. 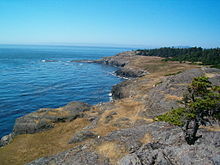 Wikimedia Commons has media related to San Juan Islands. "San Juan Islands" . Encyclopædia Britannica. 24 (11th ed.). 1911. The San Juan Preservation Trust is a private, non-profit and membership-based land trust dedicated to helping people and communities conserve land in the San Juan Islands.